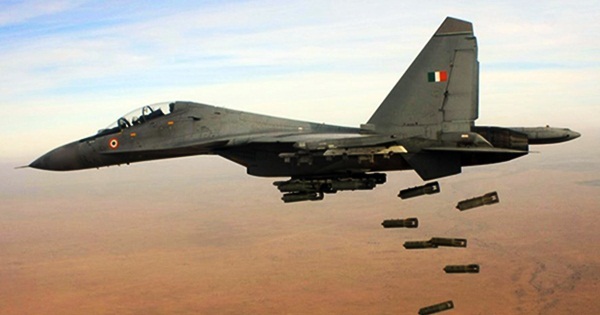 The most revolting article which borders on treason, amplifies ISI propaganda, and casts aspersions on Indian Air Force and Indian PM has been written by Ananthakrishnan Pakshirajan on the subject of the surgical strikes following the Pulwama terror attacks. I am not usually this blunt in my criticism but this time I think bluntness is in order. There is nothing more despicable than amplifying enemy propaganda when your country is at war. Nehruvian-leftists are so consumed by their hatred for anything Hindu or Indian that they even prostitute themselves in service of the enemy. I am not going to link that article as I do not want to give an artifact of treason publicity. His article, besides repeating the Pakistani ISI propaganda, is also packed with scientific illiteracy, loathing for Indian PM and IAF, and servility toward the white man. Let me sample a few. Ananthakrishnan, citing another propagandist source that he evidently agrees with, attempts to create the impression that Abhinandan Varthaman didn’t shoot down a Pakistani F-16D. He remarks that the debris of the F-16D should’ve been found in the vicinity of the wreckage of MIG-21 Bison had the former been shot down. He then demands to know why Abhinandan rather used the short-range R-73 missile than use the long-range R-77. He demands to know why Abhinandan broke away from the formation to attack the PAF squadron. Having heard the Nehruvian Delhi babu’s incredulous posers, let us watch this video by a real expert, IAF Air Marshal K. K. Nohwar: https://www.youtube.com/watch?v=4maPRqArQk8. Nohwar confirms that Abhinandan shot down the PAF F-16D. He also explains that long-range missiles aren’t very effective against F-16D and F-22 because of their stealth capability and that furball in dogfight is common which IAF pilots train for. The stealth capability of a fighter jet would protect it against Beyond Visual Range (BVR) missile strikes but it would be susceptible to a dogfight. Nohwar informs that Abhinandan did precisely what he had trained for all these years. The IAF also officially announced that Abhinandan communicated “R-73 selected” after he acquired a radar lock on the PAF F-16D and before his own MIG-21 Bison was shot down (see https://timesofindia.indiatimes.com/…/articles…/68238027.cms). Nohwar also informs us that there were two pilots in the PAF F-16D which was shot down. One of them was killed and the other was injured but survived. The one who was killed was the son of a PAF Air Marshall and deputy chief of air operations. He was unfortunately bludgeoned to death by a Pakistani mob that failed to recognize his identity. Only a toxic Nehruvian mind full of self-loathing and hatred for anything Hindu and Indian would use ISI propaganda to discredit the factual report of our own IAF air marshal and the radio broadcast of the IAF brave-heart. All reasonable persons would trust the report of our highly distinguished, professional, truthful, and courageous IAF air marshals and discount the cheap ISI propaganda. Pakistan’s DG ISPR actually showed the video footage of the fighter plane which had been shot down having initially mistaken it for the IAF MIG-21 Bison. Alas, the wreckage of the fuselage turned out to be that of an F-16! Let us ignore that and focus on Ananthakrishnan’s assertion that had Abhinandan really shot the F-16D down its wreckage should have been found in the vicinity of the MIG-21 Bison’s wreckage. Why should that be the case? Such an outcome is highly improbable. Let us say the dogfight happened at an altitude of 12,000 feet and that the two fighters were flying at around 600 kmph (because dogfights usually happen at subsonic speeds). The velocity of the F-16D, its acceleration, its direction, where and how it was hit, how far it was separated from the MIG-21 Bison, how much time lapsed before it began to glide (or explode mid-air), and the relative velocity of the R-73 missile would all determine where the wreckage would land. It could even land tens of kilometers away from the site of MIG-21 wreckage. Abhinandan as well as the two PAF F-16D pilots parachuted but didn’t land in the same vicinity which is exactly why the mob which bludgeoned the PAF pilot to death didn’t get its hands on Abinandan. In fact, the two PAF pilots didn’t land in the same vicinity. So, why should the wreckage of the MIG-21 Bison and F-16D have landed in the same vicinity? You cannot determine the landing spot of a plane wreckage by invoking voodoo physics! Unfortunately, our Nehruvian leftist is a habitual offender in this regard. Last year, displaying a compulsive urge to eulogize Don Bradman, he emphatically asserted that Harold Larwood of the Bodyline fame bowled at close to 100 mph. I asked him how he knew. He had then replied that stop watches were used to measure his bowling speed! Even a fifth grader knows that you cannot measure the speed of a ball hurled over 22 yards at high speed with stop watches. You need a radar-based speed gun. Nehruvian Delhi babus are repeat offenders when it comes to embracing voodoo physics! Our Delhi babu then remarks that all it matters is that the international community isn’t convinced that a significant number of terrorists were killed in the Balakot surgical strike. Why the f@#$ does international opinion matter? Did Barack Obama care about international opinion when he claimed to have killed Osama bin Laden and then buried him at sea? No. Did he offer any verifiable evidence? No. One could very well have wondered as to why the corpse of the most dreaded terrorist wasn’t displayed in Times Square before it was given an anonymous burial at sea. Yet, no mainstream media challenged Obama on this. None of the Indian leftists questioned Obama’s assertion. In other words, Americans merely need to make an assertion and these traitors would believe it but India should not only present evidence but also purchase international opinion? Shame on you Gunga Dins. Neither India’s PM nor the IAF commented on the actual number of terrorists killed. The NTRO presented evidence that there were at least 300 active mobile phone signals at the Balakot camp before the IAF unleashed its precision-guided fury (see https://timesofindia.indiatimes.com/…/articles…/68257918.cms). It is anyone’s guess how many of those were killed. The point is that neither Indian PM nor the IAF need to provide any proof for the casualty toll when such evidence is not demanded from the Americans when they carry out surgical strikes. The word of our PM and IAF air marshals is evidence enough. In military strikes, one cannot provide evidence of the variety which is presented in civil cases. Doing so may compromise national security, e.g., our enemies may find out what kind of resolution our satellite images are capable of attaining. Numerous retired IAF air marshals such as A. Y. Tipnis, Fali Major, and Anil Chopra all confirmed that the IAF had carried out a successful and precise surgical strike wiping out a large number of terrorists. Only a Nehruvian-leftist traitor would disbelieve those honorable men in uniform and give credence to the propagandist western media and institutions. The New York Times called the Pulwama attack an “accident.” The entire western media and establishment sold the snake oil of WMD in Iraq to invade that country and loot its oil resources. Would you trust such unscrupulous propagandist sources or trust our own honorable air marshals? Our Delhi babu is irate that Modi didn’t consult or inform the opposition leaders about the details of the surgical strike. Let me make it clear. Modi went out of the way to even appraise those traitors. Navjot Sidhu of Congress repeated the ISI propaganda that the IAF bombed 300 trees in Balakot in an alleged act of eco-terrorism. Sidhu was echoing the stance of the Congress and all of its allies which is exactly why he hasn’t been kicked out of the party. The entire opposition is guilty of treason and is not entitled to any sensitive information. I rest my case. No, just kidding. Expect no respite. It is a pity that Ananthakrishnan Pakshirajan, who has worked in the MoD, has penned an article packed with so much scientific illiteracy and hatred toward India. It is also alarming that people who would readily amplify and disseminate ISI propaganda would’ve worked in the MoD. It rarely happens anywhere except in Nehruvian India.